I quite fondly remember graduating high school; after all, the world is your oyster, you can become anything you’d like if you set your mind to it, enter next cliche here. There were many nonsensical attempts from parents and teachers letting me know that my life was in my hands. As the cold hard reality set in (it didn’t take long), the only thing that was really there for my group of friends and I was the heavy music that we constantly listened to at the time. 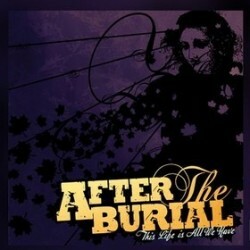 Everyone had their favorite band, and mine happened to be After the Burial. Their Forging A Future Self album had been the soundtrack of my 2006 year, and even at that time being the novice I was as a music listener, the only gripe that I had was the production of the album. Off-kilter and intelligently constructed breakdowns combined with creative riffs made this album incredibly impressive, and I was even more excited about their live show antics. When their release Rareform hit stores a few years later, I was a little less into the style and thus it did not resonate with me as much. The variation was still there, but I couldn’t hear the passion in the music quite like Forging A Future Self. What After the Burial have done here is re-recorded the best three songs off of that album with a renewed sense of vigor and energy for This Life is All We Have EP. Many people will most likely ask the same question that first came into my head regarding this decision; why exactly did the band make the decision to record the same material again, and only a portion of it at that end? Well, regardless of the reasons that are behind it for the band, the truth is that they couldn’t have picked three better songs from their first release. They are punishing, creative, and finally, recorded the way that they should have been heard the first time around by fans. “A Steady Decline” shows off the powerful range of newer vocalist Anthony Notarmaso and brings a fun energy and atmosphere from the start. “Fingers Like Daggers” starts off with a very passionate acoustic-picked intro that lays the groundwork of one of the best songs that they have ever recorded. The clean vocals that enter around the halfway mark are much better-sounding this time around, and the fact that most of the band have been around since its inception in 2004 really help this recording as well. There is a decidedly tighter feeling in the performance of the band as a whole, and as unnecessary as it may seem, this release was a smart move on their part. It gives listeners new to the band a sampling of their strongest songs, and allows older fans a new take on some favorites. This is something of a fan-appreciation release, and it is worthy of checking out for anyone interested in technically proficient, creative metalcore. Hopefully this release means that After the Burial are embracing their roots and looking to expand on a different avenue of creativity.